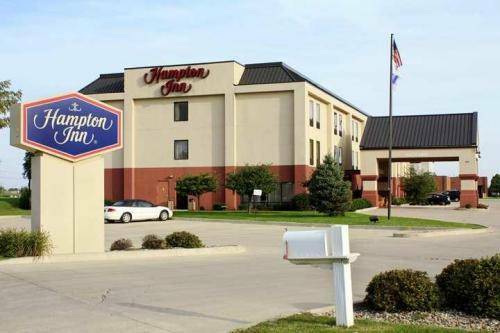 The beautiful Hampton Inn Bloomington West hotel is located on the west side of Bloomington Illinois. Hampton Inn hotel is the leading chain of quality value-priced hotels. When staying in Bloomington you receive a clean fresh comfortable room and welcomed with a smiling friendly helpful face and courteous service. Begin your day by enjoying our complimentary hot and cold breakfast that is provided by the hotel. The breakfast offers a variety of breakfast items such as eggs sausage biscuits and gravy cake French toast coffee juices donuts waffles bagels fruits yogurts and much more. End your busy day in the hotel indoor heated pool with a relaxing swim. All hotel rooms at the Hampton Inn are well appointed with the comforts and conveniences of home. In Bloomington Illinois nearby the hotel are shopping parks golf museums recreation restaurants entertainment and all the other services and attractions. The hotel has both high-speed wireless internet access and wired internet. Whether you are a business traveler or leisure guest in Bloomington the Hampton Inn hotel is sure to please. Come and enjoy the hospitality of Hampton Inn Bloomington West with 100 Satisfaction Guaranteed. We love having you here at the Hampton Inn Bloomington West hotel in Illinois. All reservations must be guaranteed with a major credit card or advance cash deposit to hotel regardless of time of arrival. All reservations must be cancelled by 6pm host time unless deposit required. Policy subject to change. 12-foot-tall Abe on a 24-foot-tall covered wagon -- the largest in the world. Badly damaged in a January 2014 wind storm, but the town had it repaired by late April. For those who can't get enough of Route 66 in Illinois by driving on it -- a collection of memorabilia and Bob Waldmire's School Bus Road Yacht. With their steaming tankards, coffee pot ladies gave the battle-bound GIs of World War II the fuel they needed to whomp the Axis.